China has has a one child only policy since the 1970's. 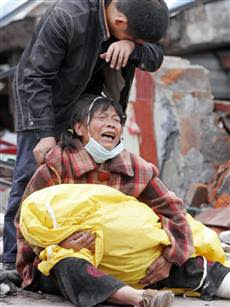 Now, after the devastating earthquake that killed so many children, many parents are now without any children. The people of Myanmar have had a really tough time also. Almost 100,000 killed and their government not accepting all the aid that is offered. Here in the northeast of the United States we have to be very grateful for the weather we have. In my lifetime (almost 52 years) we've had our share of hurricanes and an occasional minor earthquake or tornado, but we haven't had any natural disasters similar to the ones that have crippled other parts of our country and the world. We've been very lucky.